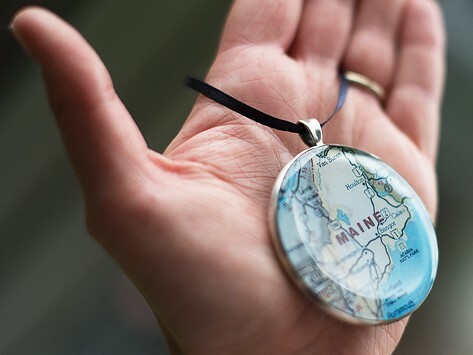 The double-sided Archipelago Ornament is the perfect gift to relive your most cherished memories and their coordinates. Displaying your personalized map imagery on the front and custom message on the back, it creates a keepsake of your most treasured territories with an added dedication that will be enjoyed year after year. Dimensions: Ornament: 2" diameter x 0.25"; Ribbon loop: 3"
Unique & personal holiday gift! I had this made to memorialize the coordinates where my grandfather's ashes were spread. They truly made my idea an amazing memorial! This is the most awesome EVER! That company worked diligently to get the EXACT map I wanted & didn't give up on my wishes. I bought this as a Christmas gift and not using as an ornament. It will be on a chain as a necklace! After receiving it I just had to have one for myself so I ordered another. I have worn mine & everyone that saw it is amazed at the details!